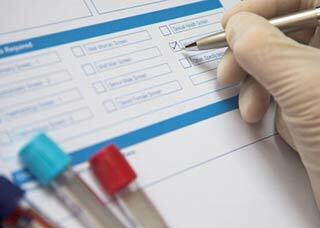 First Choice Labs USA can provide you with guaranteed savings on blood testing laboratory services. As quoted in the Huffington Post, "..We service the uninsured or those with high-deductible plans..for a simple blood panel screening billed by an insurer for $414 when ordered with First Choice Labs Costs much less". PLEASE NOTE: In order to use our services a Doctors Prescription is REQUIRED! Many families who could not afford health insurance have used First Choice Labs USA to provide early diagnosis of severe health issues. We can save you time and money guaranteed! We will take your basic information and specifics from your prescription. Payment is made to First Choice Labs USA. First Choice Labs USA faxes your requisitions to a location convenient for you. Results are mailed to patient and faxed to your physician. NO Additional Draw or Processing Fees! Click Here to Enter preliminary information! Add PSA, A1C or Vit D For a small extra fee. Results typically in 24-48 hours! First Choice Labs USA Copyright 2010. All rights reserved.